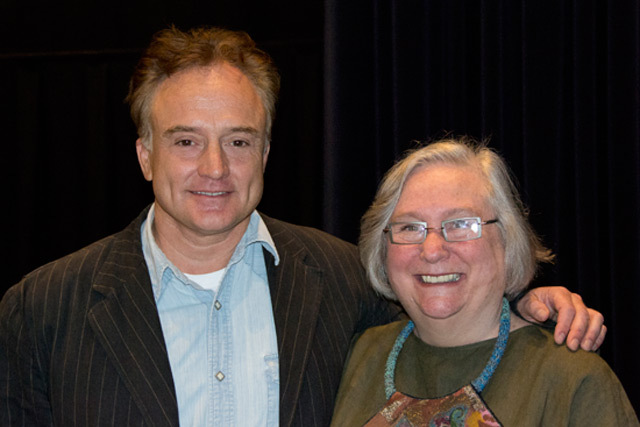 Speaking in the Center for Film Studies on Sept. 24, actor Bradley Whitford ’81 shared wisdom on subjects ranging from show business to politics to dealing with the insecurity inherent in being an actor. Whitford addressed an audience of film and theater majors, prospective majors and alumni. Best known for his role as Josh Lyman on The West Wing, Whitford was recently elected to Wesleyan’s Board of Trustees. He has also had starring roles in the shows Studio 60 on the Sunset Strip and The Good Guys. Recently, he co-starred in a film, “Cabin in the Woods,” written by Joss Whedon ’87. In introducing Whitford, Jeanine Basinger, the Corwin-Fuller Professor of Film Studies and chair of film studies, highlighted a few lesser-known facts about the actor: In 2007, he was honored by the Alliance for Justice for his political involvement. (Basinger pointed out this interest in the wider world outside the arts marks him as a typical Wesleyan product). He is the father of three children, a certified yoga teacher, and is deeply committed to his juicer. Asked about the development of his own career, Whitford shared advice he got from Clint Eastwood early on: “hit singles,” meaning take the best job available at the time—not necessarily always a home run—to keep working. Whitford stressed the importance of taking on diverse roles in theater, film and television. For students wanting to direct, act or produce, Whitford strongly encouraged them to begin writing. “Storytelling is what it all comes down to,” he said. “You need to fight for the kind of material you want to do and be as proactive as you can,” he said. Whitford imparted advice on dealing with the insecurity that so often comes with pursuing a career in show business. He advised the audience to “beware of dogma in filmmaking, screenwriting, acting and teaching,” and warned them of the challenges in dealing with directors who attempt to take too much control over actors. Whitford also discussed how movies and television have changed over his lifetime—largely as a factor of pure economics. “Years ago, the people who ran NBC were professional storytellers. Now, they’re media guys who have to keep it profitable, or they’re gone. There is so much pressure on network television because of DVDs, because of games, because of all the other places that people are going,” he explained, adding that “The West Wing” would not be picked up today because it wouldn’t make a profit for the first several years. When “The West Wing” was at its peak, it drew about 20 million viewers, Whitford said. Today, any show getting 6 million is a huge hit. Even an enormously successful show like “Mad Men” until very recently only had about 900,000 viewers. Yet with their business models, the cable networks can afford to produce shows like this, because the media attention and positive reviews the shows receive persuade viewers to add the network to their cable packages. Whitford also felt the quality of movies has suffered since his childhood. “The movies that studios were making—‘Godfather,’ ‘Dog Day Afternoon,’ ‘Serpico’—movies I walked out of and fantasized about someday making something like that, Hollywood does not make anymore,” he said. Whitford, who has long been politically active, also shared his views on politics (with the disclaimer that having played a presidential staffer on television doesn’t necessarily make him an expert). He is currently working on the Obama campaign for re-election.